Congratulations to the ten authors chosen. I am so looking forward to meeting them and hearing them read their stories on the night. As co-organiser of Stroud Short Stories for the first time, I have loved every single second of reading the record-breaking fifty stories submitted. It has been a real pleasure and a true honour. I am really grateful to everyone who submitted a story. The overall quality of the submissions has been very high. Based on the number of excellent stories I received, I could have comfortably organised two, or even three, reading events of ten stories each. Stroud Short Stories will be held at SVA in John Street, Stroud at 8pm on 25 May. 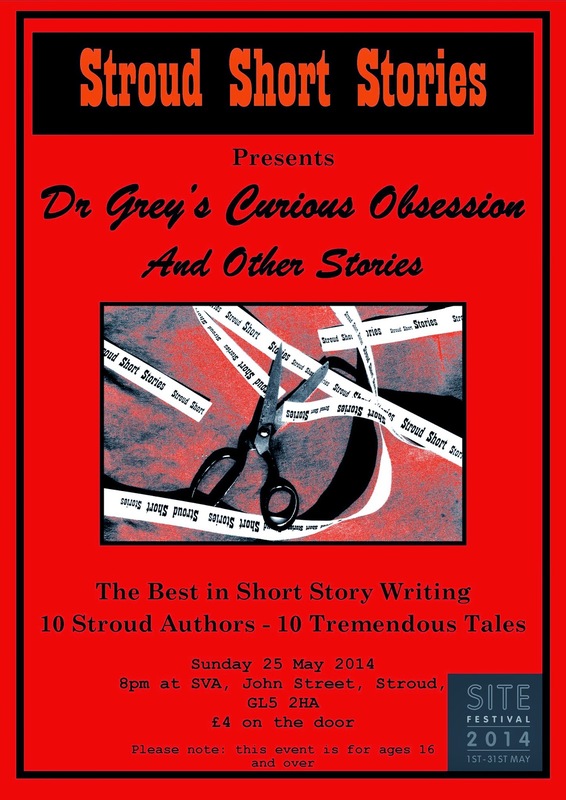 I have called the event “Doctor Grey’s Curious Obsession and Other Stories”. Submissions to the May 2014 Stroud Short Stories are now closed. There were a record-breaking 50 submissions by 33 authors. The names of the ten authors to read at the SSS event on the evening of Sunday 25 May (8 pm, SVA, John Street, Stroud) will be revealed in the next few days. Thank you to everyone who submitted stories.